The bell ringing chamber was created in 1878 out of Wren’s original bell tower along with a sounding chamber and a bell housing chamber above. The tall octagonal room is used by members of the Ancient Society of College Youths to ring the twelve cathedral bells in celebration of significant events. The names of Cathedral Ringers present on the most important occasions such as the coronation of the Queen or the state funeral of Sir Winston Churchill have been recorded on a set of painted peal boards which adorn the walls of the Chamber. 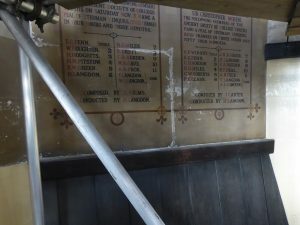 Architectural paint research shows that following the 1878 campaign of thorough paint stripping, the walls had been decorated with oil bound distemper known as Wilkin’s Patent Paint. This had subsequently been followed by as many as fifteen further schemes of distempers, lead oil paints and modern oil paints. 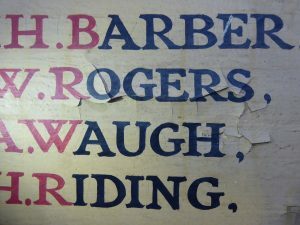 These had frequently been applied to localised areas of wall or around the existing peal boards. 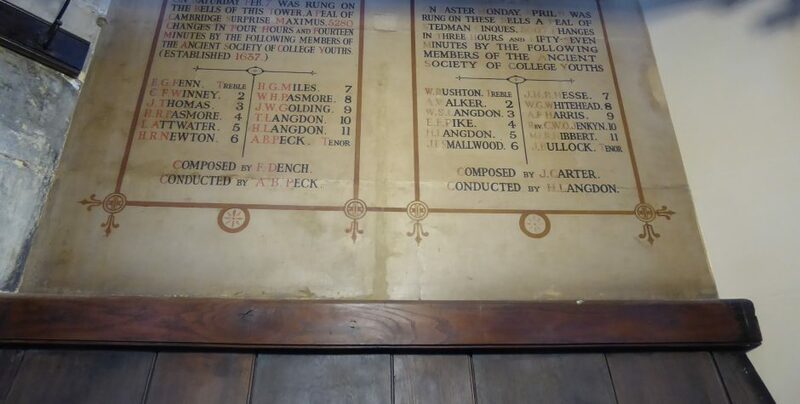 All of the above, as well as evident difficulty in colour-matching during recent campaigns of redecoration had led to walls with a patchy and tired appearance, localised failure of the painted inscriptions and overall paint stability issues. This had been caused by the lack of water vapour transmission through the walls and curing stresses of modern paints. 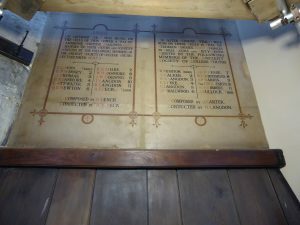 The programme of works involved the cleaning of exposed stone and historic surface finishes to include the peal boards, removal of outer layers of plain glossy paint down to the more permeable schemes or to the stone substrate, and localised application of Keim Optil and Restauro-Lasur mineral paints in a ‘stone’ colour in order to resolve the issue of colour patchiness. 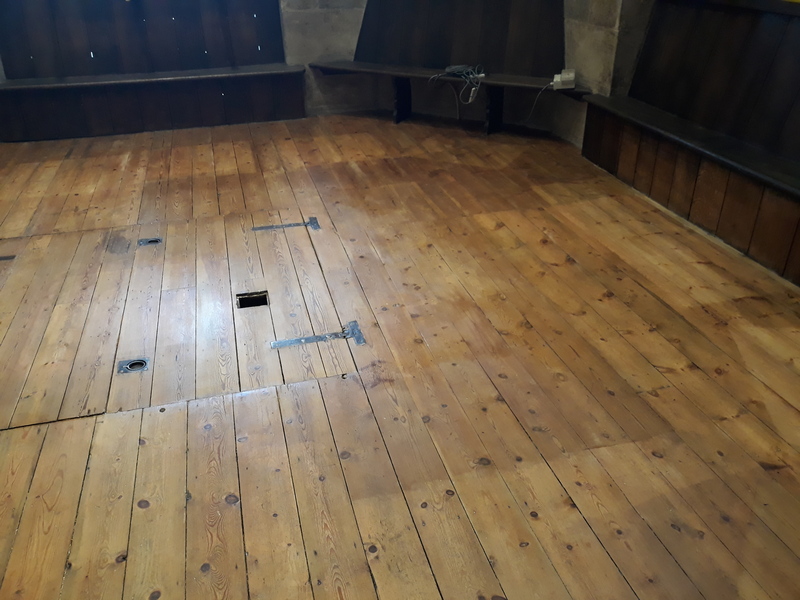 During the initial site investigation we found several areas of failing paint to the peal boards, mainly where bordered by modern glossy overpainting, or affected by moisture ingress or damaged by mechanical works. The flakes were stabilised using a selection of suitable methods and synthetic adhesives. Areas of loss were retouched utilising reversible watercolours. In addition, we also retouched small mortar repairs that had been skilfully applied by the Works Department. 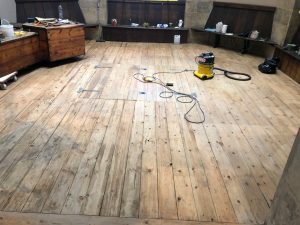 Other works involved removal of worn lacquers and waxes to the timber floor and a set of benches, and re-finishing in sympathetic and sustainable coatings. Images showing the floor following removal of worn coatings and refinishing. 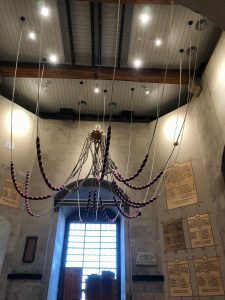 We also had the chance to work alongside other specialists to include the bell hangers who worked for the world’s largest working bell foundry John Taylor & Co., who were working on the restoration of the set of bells they had supplied to the Cathedral 140 years ago. Also working on site were carpenters fitting the new Chamber ceiling and a stone carver, Tom Sargeant who was cutting the names of the recently deceased Bell Ringers into the stone of the marble Obituary plaque. 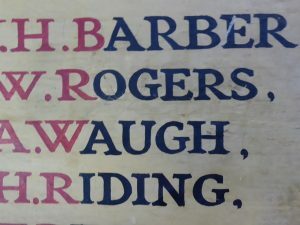 Area of inscription shown before (L) and after (R) treatment following consolidation and retouching.